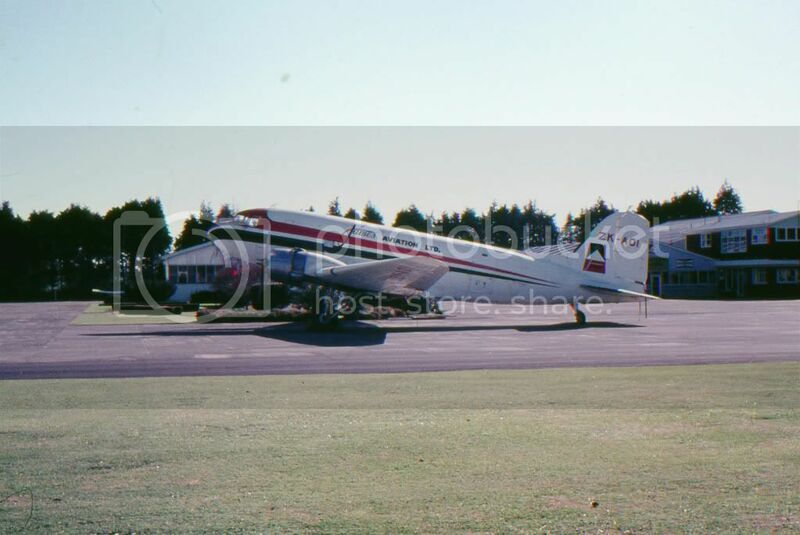 I think this is AZA at Taieri in the late 70s at the airshow the Queen attended. I was just thinking the other day you never see people in Swannis like you used to. 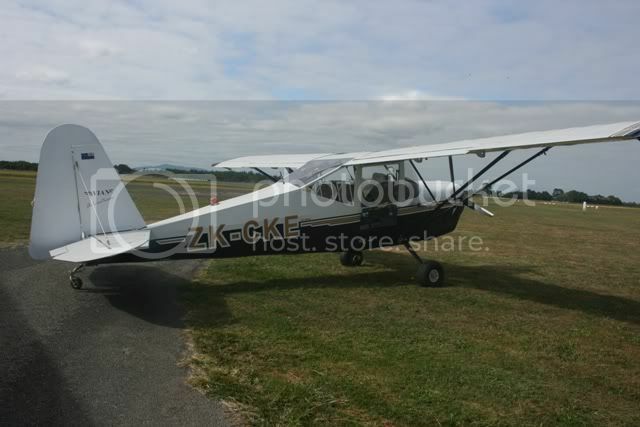 Is it just my perception (or sketchy research) or did the Ag-Dak have a relatively enviable safety record for an ag aircraft in NZ? The obvious and unfortunate exception to this being ZK-AOI, which according to Phillip Treweek's website crashed at Clarence (or was it Seddon - quite a long way away) in 1973 after a structural failure? For a large aircraft in intensive use, at low altitude and in a role for which it had not been designed, this seems counter intuitive. Or have I got this wrong? Indeed the AG DAKS had a very good safety record. "Life time" on the spars etc meant they were suited for these operations. Some more shots of James's DAK's. That last one's a ripper shot with the pax conversion to the cropmaster. 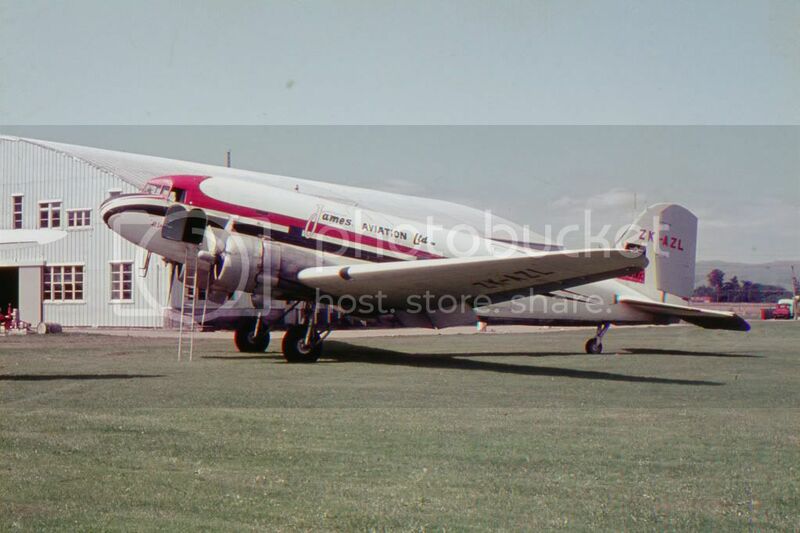 And Inky Pinky as I remember her from her stay with the Wgton Aero Club. Classic photos there Mike. 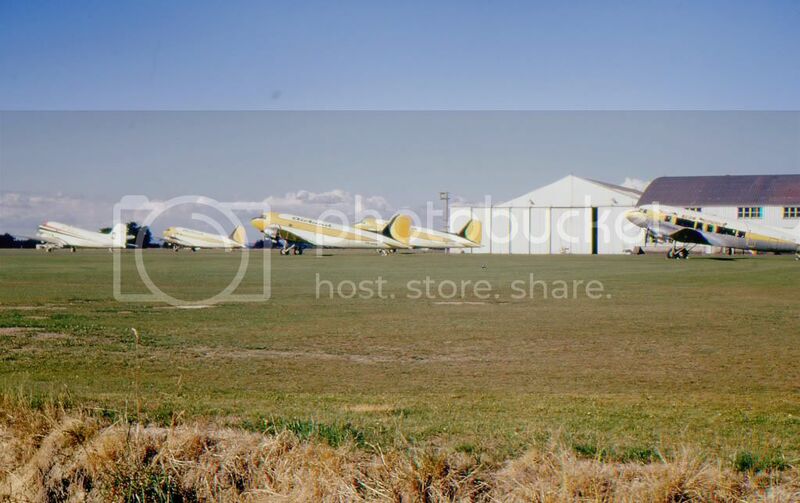 In that first one, what is that on the ground in front of the C-47? Is it a dog? Great photo's thanks folks!! Love the last one with cars you just don't see anymore. 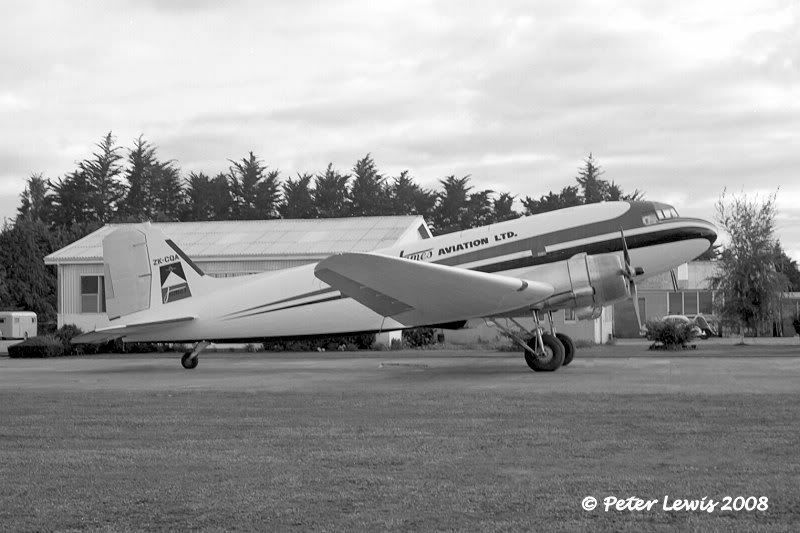 I grew up in Whakatane and as a kid, managed a few rides with Bill Petersen when he came through once or twice a year. Last ride in an ag-Dak was with Bruce Thompson in GS in BBJ not long before her final flight as a topdresser. Great days!! How many daks were coverted to ag flying, seems to be quite a lot. What's with that yellow and white one in the Palmerston Nth. 5/2/71 photo with all the side missing?? I never knew there were so many topdressing Dakotas. Did they ever use them for spraying in NZ as well as topdressing? Also, how many crew members were required to fly one in topdressing? I assume the navigator was dropped, but did they still have two pilots and an engineer aboard? To answer my own question I have dug out and begun to rewatch the awesome footage of the last agricultural Dakota flying filmed by Louis Forhecz in the 1980s, which someone here kindly sent me on DVD. 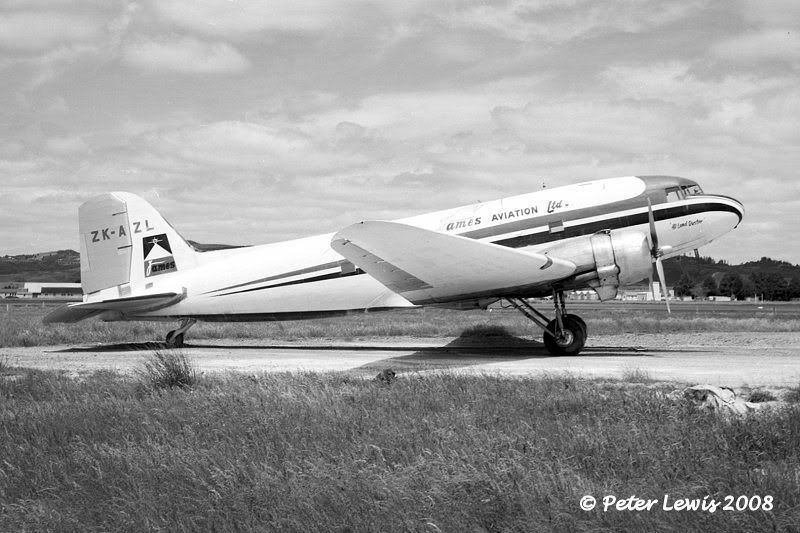 It seems only Bruce Thompson was aboard - surely the Dakota would be quite a handful to fly low kevel with just one crew member? Were they modified in any way to make sole pilot flying easier? Further question - as topdressing is (I believe) seasonal, did the Dakotas fly in other roles such as freight carrying when there was no topdressing happening? Or were they laid up for the winter, etc? Also, did Country Calendar ever do a feature on the Ag Daks? It would be nice to see some footage done by professional TV crews of them flying in the hills. And did other countries fly Dakotas as topdressers? Was NZ the first place it was done? 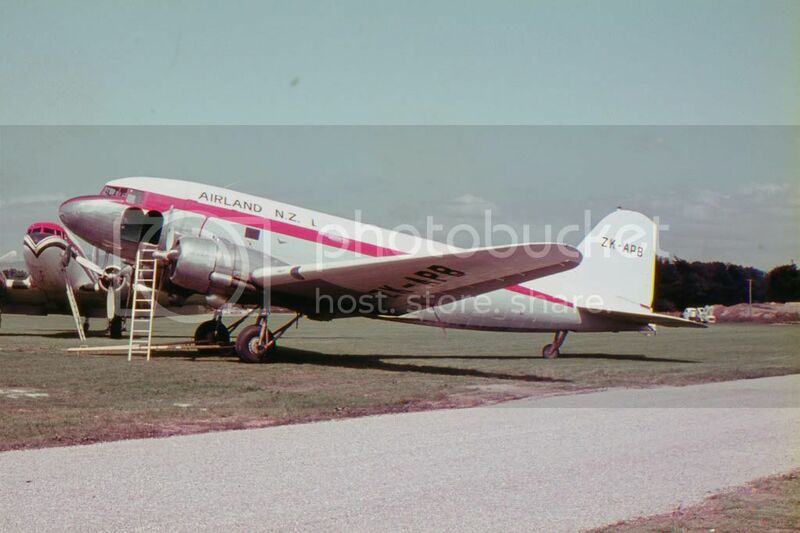 Dave, that is ZK-CAW,a Viewmaster operated by SPANZ.It had black plastic sheeting over the windows.Photo taken shortly before it was converted to a topdresser.The most Daks I ever saw outside Airland/Feildair at Palmerston was ten.Fourteen were converted to topdressers plus another couple reduced to parts. AZL was the first aircraft and was flown by a two man crew but was later modified to single pilot,as far as I know all others were modified when they were converted to topdressers. I believe NZ was the only country to use them.